Your character is your personality. Another way to describe character is to say it is the way you act. When people talk about character they use words to describe someone’s personality. These words are called character traits. For example, if you sit by the new girl at school in the lunch room so she isn’t sitting by herself, people would say you are friendly, kind, and caring. These words are character traits that describe the kind of person you are. Or…if you stomp off the field after losing a game instead of telling the winners they played well, people might describe you as a sore loser or selfish. These are character traits, too—just not the kind you want to have. Having the right kind of character traits is important. It gives you the superpowers you need to be Captain Character! 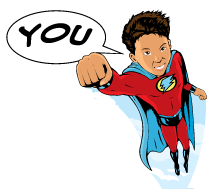 Captain Character is the best superhero ever because he or she makes the world a better place by caring about others and about themselves. Captain Character always tries to do the right thing and never hurts anyone or anything on purpose. Captain Character can be short or tall. Captain Character can have any color of skin. Captain Character’s hair can be curly or straight, black, blonde, brown, or red. Captain Character can live anywhere in the world. 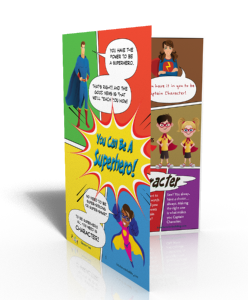 Captain Character can be anyone…including YOU! Are you ready to be a superhero? Great! But before you do, you need to make sure you’re ready, willing, and able. So...read over the Captain Character Pledge below. Read carefully because it is important. 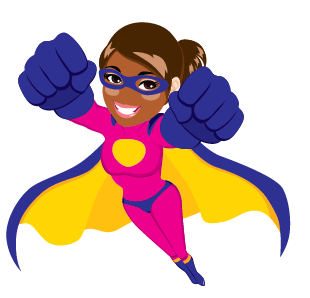 After you are done reading, if you are willing to live up to the Captain Character Pledge, repeat the following and YOU will become a superhero possessing the superpowers of character. Respectful: I will treat others the way I want to be treated. I will not be rude. I will not interrupt people when they are talking. I will listen and obey my parents, teachers, and other people who are in charge. Kind: I will be kind to people and animals. I will use good manners—saying, ‘please’, ‘thank-you’, ‘excuse me’, and ‘I’m sorry’. I will not make fun of people or bully them, and will help those who are being bullied or being made fun of. Compassionate: I will help people who need help. I will share what I have with other people when they need me to. Honest: I will tell the truth at all times no matter what. I will obey the law, the rules at school, and at home. Friendly: I will make people feel welcome and happy to be around me. I know I am not more important than other people so I will not act like I am. I will smile, be helpful when I can be, and will not talk about people in a mean way. Cooperative: I will follow the rules. I will not be selfish and expect to get my way all the time. I will be happy for other people when they win. I won’t brag and be a show-off when I win. Bossy: I will not be bossy or get mad when I am not in charge or when someone else’s idea is more popular. I will be a good listener and not always have to be the leader. Angry: I will not lose my temper when I don’t get my way or when I don’t like what is happening. I will be calm and respectful. Rude: I will not mistreat animals. I will not be mean to people or be a bully. I will not use unkind words. As Captain Character I know I can make a difference at home, school, and in my community by being the very best person I can be. 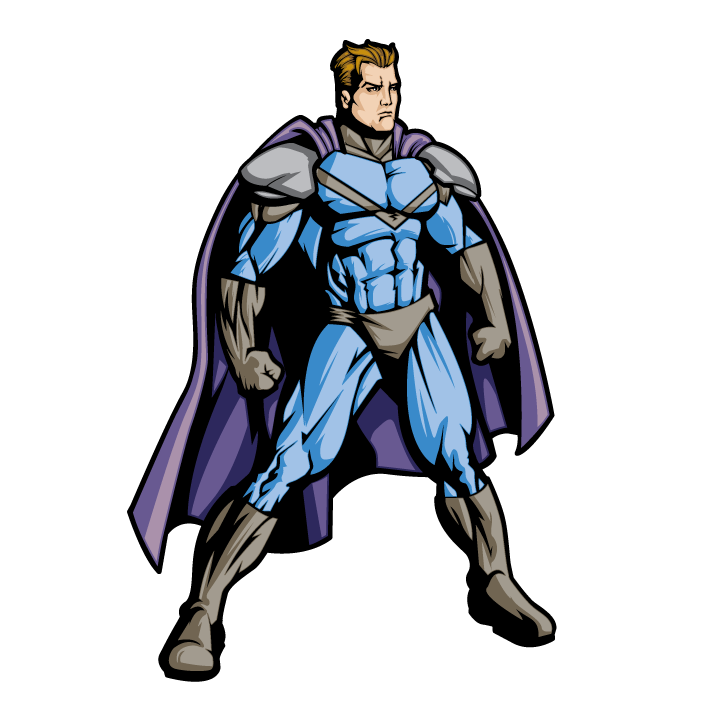 My name is _______________________ and I am Captain Character! You have it in you to be Captain Character. Everyone does if they choose to be. Making good choices is what character is all about. When someone hurts you or mistreats you, you have a choice to make. Will you get angry and fight back or will you be Captain Character and do the right thing by not letting it get to you or telling someone in authority so the problem can be handled correctly? When your friends get mad at each other and ask you to choose sides, will you, or will you be Captain Character and help them make up? When you don’t want to clean your room or watch your little sister, will you argue with your parents or will you be Captain Character and obey? See? You always have a choice…always. Making the right one is what makes you Captain Character. This article is available to my newsletter subscribers as a free pdf booklet. Both a colored and black and white version (for those reproducing for their classroom) are provided. 4 activity sheets, two for grades 123 and two for grades 456.